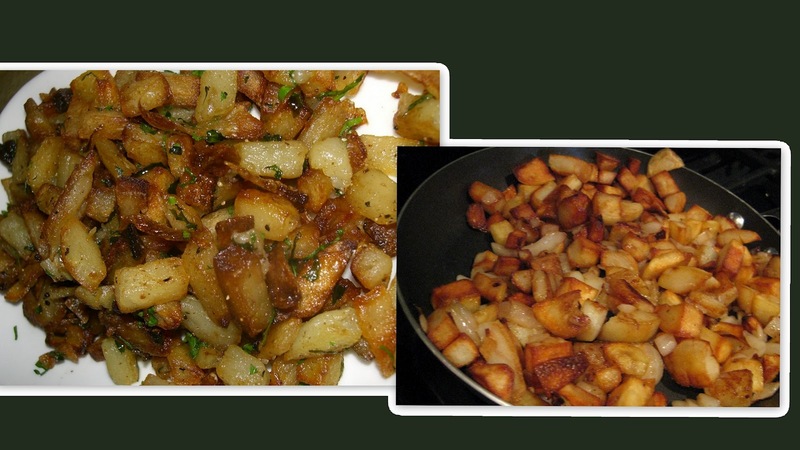 Fried potatoes is nearly always a side dish with our game lodge. Here is a absolutely fabulous version. To make a small portion as a side for 4 people. 2 large potatoes peeled and cut into discs quarter inch (about 7mm) thick then halved into "C" shapes. 1 small onion halved and also sliced. 3 or 4 spring onions with half the green tops is way better if you can lay your hands on some. Par- boil the potatoes in boiling water for 10 minutes. Brown the onion in a little olive oil and remove. Brown the potatoes being careful not to break them up to much. Add the onions and sprinkle the two teaspoons over the potatoe and onions. Add a good shake of black pepper. Keep shaking the pan and watch it like a hawk so that the brown sugar doesnt burn. A few browny almost burnt bits is nice though. Remove it and keep it warm, uncovered (so it doesnt go mushy) until the rest of your Breakfast is ready to serve. This is so popular in my family that I often make larger amounts and serve it as part of a main course. The last time I had potatoes with sugar was in Denmark and while delicious, they were VERY sweet. I'm going to give your recipe a whirl...sounds delicious, especially with the little almost burnt parts! Yes there is something about the sugar. I think it sort of caramelizes slightly. This way is not too sweet at all. You will notice this recipe only uses two teaspoons of brown sugar. You can add more to taste. I have also used honey which is also a nice alternative.